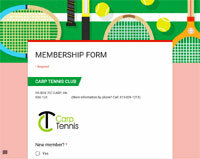 NEW or RENEW YOUR MEMBERSHIP! In May and June 2019, the OTA will be providing more sessions for the children under the CAPITAL KIDS program. These will take place on our courts in Carp located in the fair grounds by the splash pad and will provide an additional, fun introduction to tennis. Day and time to be announced soon. This program is open to all children in the area. The exact cost will be announced soon but will be very low again this year for 4 weeks of lessons.